The Syndicate normally maintains a policy that the real world does not factor into the gaming world at all. We care about the person (their integrity, loyalty, dedication, motivation, friendliness etc..) and not where they come from or what they look like or what they believe in or what political party they are part of. That is one of the unique things about the gaming world and about The Syndicate that we are proud of. However, horrific events like Sept 11th, 2001 and events that shape the whole world, like the war in Iraq do affect us and as such are significant parts of our guild history. The war in Iraq, in 2003 took a number of Syndicate members away from the gaming world for months. We had members serving in all branches of the military. We had frontline Army and Marine members. We had members of the airforce in the skies over Iraq on a daily basis. We had members in the Navy both in the Persian Gulf and aboard. We had members in Afghanistan continuing the war on terrorism. And we also had members of the coast guard on increased duty to defend the US from possible attacks. Losing touch with some of our members was a tense experience at times. One such member was part of the marine maintenance batallion that was ambushed and had prisoners taken. For several tense days we were unsure if he was among them or not. Thankfully he was safe. And we know of no members that were lost in the combat. 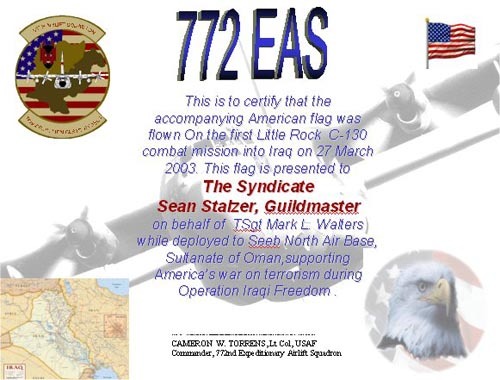 Two Syndicate members were part of an AirForce squadron that flew regular missions over Iraq. On one such mission, they honored The Syndicate by flying the US flag on that mission, in the guild's honor and then presented that flag along with a certificate commemorating it, to the guild. 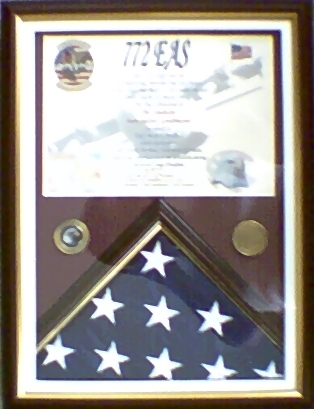 That was a very big honor for us to receive that flag and we have it displayed proudly. Below is a picture of the certificate that was presented to us. We would like to say thank you to those members and to all our members who risked their lives to help combat terrorism and to help make the US and the world, safer.